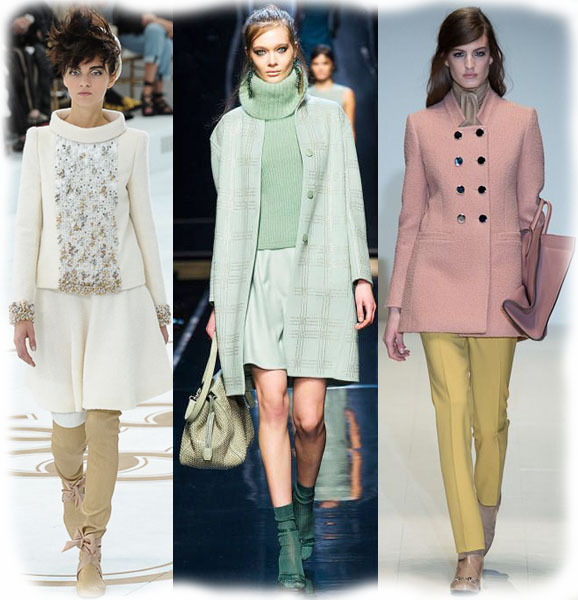 Fabulous In 4 Ways: Pretty Pastel Looks For Your Winter Wardrobe! Pastels don’t only belong to spring time. They’re the perfect color palette for winter, paired with metallics when you’re looking to avoid an uber-holiday-inspired outfit. Also, pastels this time of year isn’t such a crazy fashion risk when you think about cuddly sweaters against the outdoor snowy landscape. Some of our favorite celebrities have turned to pastels when hitting the red carpet or making a street style splash. Fashion it-girl Olivia Palermo mixed a white Dior jacket with a ruffled pastel skirt & blinged out belt. Young actress Elle Fanning played with pastel hues with a houndstooth dress, blue jacket, & floral heels by Miu Miu. Scandal actress Kerry Washington was a knockout in a lace & brocade Oscar de le Renta gown & matching pink minaudiere. Camilla Belle stole the spotlight in a pale green Gucci crop top & matching skirt with gold metallic sandals. Oscar-winning actress Lupita Nyong’o made a splash at Fashion Week in a pale purple Calvin Klein sweater dress with a gray clutch & matching strappy sandals. The always glamorous Victoria Beckham showed off a relaxed separates look in a white t-shirt & blue wide leg trousers by Malene Birger. If that isn’t proof enough that pastels belong to the colder months, plenty of designers displayed Fall Collections featuring pale pink, periwinkle, lilac, mint, winter white, & yellow. This includes pastels featured on the runway by Reed Krakoff, Rebecca Taylor, Ralph Lauren, Chanel, Ermanno Scervino, & Gucci. I put together some outfits, inspired by some of the prettiest pastel colors in stores this season. Of course, there are other hues to make any Style Darling swoon, but the working pale blue, winter white, blush pink, & mint green into your winter wardrobe will make everyday staples like rhinestones & sparkles, as well as cold weather accessories really pop. Shop the affordable & casual separates look: LC Lauren Conrad sweater ($29.99) in snow blue @Kohl’s, pants ($34.00) in soft sky @Neiman Marcus, flats ($14.99) in silver @Payless, & studs ($3.90) in silver @Forever 21. Surprise at a cocktail party in winter white with: dress ($24.00) in ivory @Dress Barn, flats ($39.98) in bone @ALDO, pearl necklace ($13.00) @Charming Charlie, & nail polish ($11.20) in Casper @Julep. Monochromatic blush pieces create a professional, yet feminine look: top ($32.94) in pink @Old Navy, pencil skirt ($19.80) in blush @Forever 21, bootie ($19.94) in blush @DSW, & necklace ($42.00) in peach @BaubleBar. Mint makes everything better- even a chic daytime look: tunic sweater ($49.90) in green @Express, jeans ($29.99) in white @JC Penney, ankle strap heels ($28.50) in mint @Charlotte Russe, & necklace ($16.50) in mint @Icing. 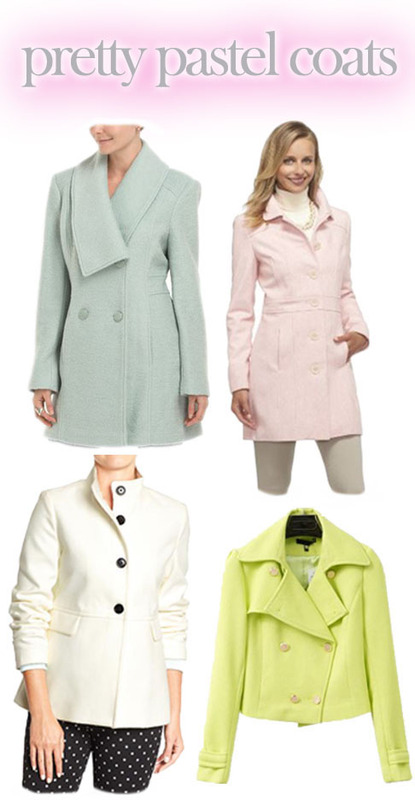 Lastly, to break up the monotony of this chillier season, add a splash of pastel to your wardrobe with a winter coat. While black & grays have their place in a classic must-have closet, mix it up with the paler shades in rich textures like wool & leather. Button up for a sweet day of sweet colors, matched with metallic scarves & jewel details when wearing: swing coat ($36.00) in sea salt @Old Navy, flip collar coat ($119.00) in mint @TJ Maxx, wool coat ($69.99) in pink heather @Target, & leather coat ($54.00) in yellow @ChicNova. 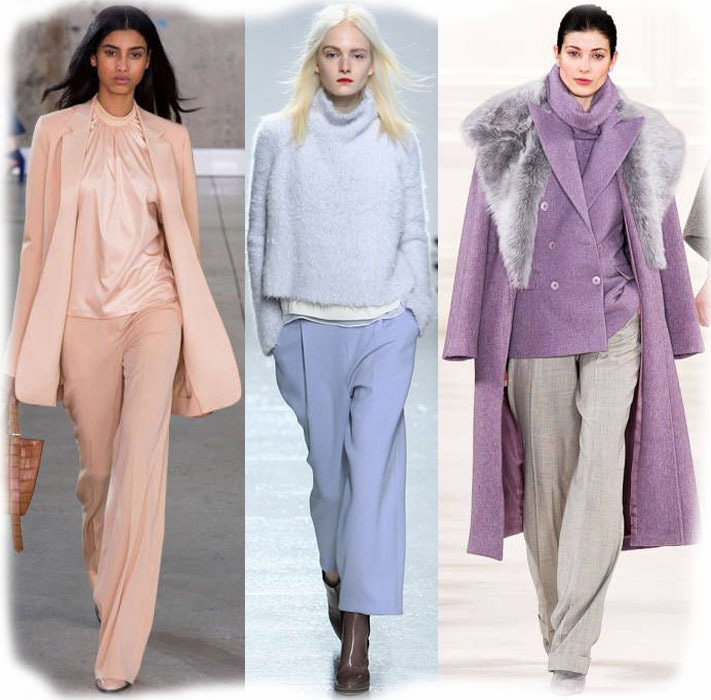 What’s your favorite pastel color for winter? Do you wear more brights or saturated colors? Which outfit is your favorite? For more stylish posts, check out all-in-one cosmetic kits for the holidays, affordable cold weather accessories from Francesca’s & H&M, Anna Kendrick’s Marie Claire cover shoot for the December 2014 issue, & Gwyneth Paltrow’s new ad campaign for Max Factor! Happy Styling! This entry was posted in Accessories Access, Basics for a Bargain, Color Me Style, Fabulous in 4 Ways, Quickie Darling Deal & Steal, Red Carpet Review, Runway Rundown, Show Me The Shoes, Style Darling Daily and tagged Accessories Access, affordable fashion, Aldo, Basics for a Bargan, BaubleBar, By Malene Birger, Calvin Klein, Camilla Belle, celebrity inspiration, Chanel, Charlotte Russ, Charming Charlie, ChicNova, cold weather accessories, Color Me Style, Dior, Dress Barn, DSW, Elle Fanning, Ermanno Scervino, Express, Fabulous in 4 Ways, fashion, Forever 21, Gucci, Icing by Claire's, JC Penney, jewely inspiration, Julep, Kerry Washington, Kohls, LC Lauren Conrad, Lupita Nyong'o, metallic flats, Miu Miu, monochromatic fashion, Neiman Marcus, Old Navy, Olivia Palermo, Oscar de la Renta, outerwear, pastel, pastel coats, pastel leather jacket, Payless, Quickie Darling Deal & Steal, Ralph Lauren, Rebecca Taylor, red carpet, Red Carpet Review, Reed Krakoff, runway rundown, Scandal, Show Me The Shoes, snowflake sweater, sparkly nail polish, stud earrings, style, style for days, Target, TJ Maxx, Victoria Beckham, winter fashion, winter style, wool coats. Bookmark the permalink. ← Beauty Buys: All-In-One Cosmetic Kits For The Holidays!